Normal gametocyte formation. Males activate and become motile. Number of macrogametes and zygotes reduced. Deregulation of components required for protein synthesis. Immunofluorescence localisation of LANCL1 in uninfected and P. falciparum-infected erythrocytes. Un-infected erythrocytes and P. falciparum-infected erythrocytes at different stages of the parasite intra-erythrocytic cycle were fixed and permeabilized. 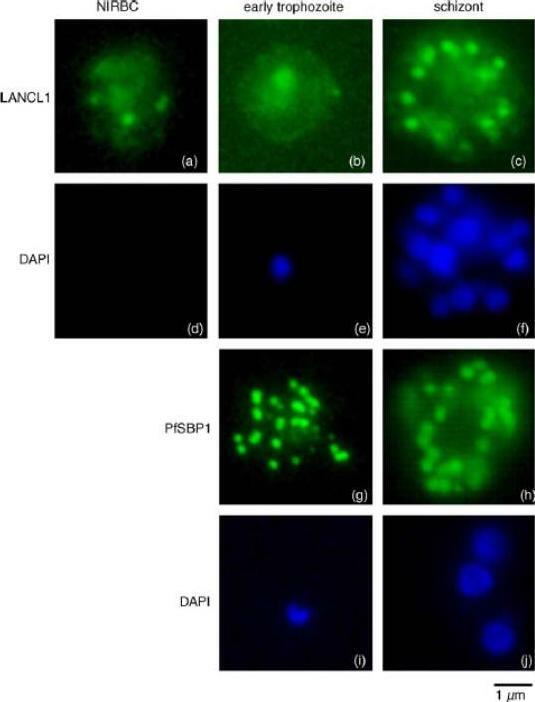 Immunofluorescence analyses were performed using the rabbit H60 LANCL1-specific serum, and a mouse serum raised against the carboxy-terminal domain of PfSBP1. DAPI staining of the nuclei assessed the stage of the intra-erythrocytic parasite (in blue). In uninfected erythrocytes (a) and early trophozoites (b) a pattern consistent with a cytosolic localization and spots of aggregation of LANCL1 is observed. In P. falciparum schizonts (c), an additional labelling similar to that obtained with PfSBP1-specific antibodies (g and h) is observed, suggesting a Maurer’s cleft-like localization of LANCL1.Blisnick T, Vincensini L, Barale JC, Namane A, Braun Breton C. LANCL1, an erythrocyte protein recruited to the Maurer's clefts during Plasmodium falciparum development. Mol Biochem Parasitol. 2005 141:39-47. Copyright Elsevier 2010.